That’s what happened the moment Debbra Sweet hit the wall: literally. Emotionally captivating. Profoundly heart wrenching. An extraordinary 30 year quest for answers on ‘what changed that day’, unknowingly living with & finally recovering from a severe traumatic brain injury (SBTI), revealed to the author how to harness the brain’s power and Learn to Triumph Over ANY Challenge life presents. 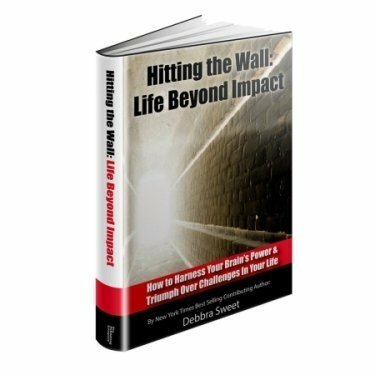 Now Debbra reveals her insights in the upcoming book “Hitting the Wall: Life Beyond Impact”. Living through 3 periods of time (a total of 10 years) where Debbra lost the ability to walk, talk, learn, remember is the story that is woven throughout this book, but it’s the insights and understanding she gained along the way on how to Triumph Over ANY Obstacle Life Presents that is revealed to her readers and live audiences she speaks to. Debbra’s experience gave her insights into how to harness the power of your brain in order to unleash your human potential and triumph over every situation. Her experience is unique. She has insights rarely able to be shared by those who endured SBTI. The revelations shared within Debbra’s forthcoming book and her inspirational speaking on this subject will support those who are living with SBTI, or are ‘normal’ brained. It’s been well documented that humans use less than 10% of their brain. We literally can reprogram our brain in order to triumph over any challenge life brings. Big or small, young or older, be filled with inspiration, hope and practical steps empowering you to come out strong no matter what your challenges are. To stay updated on the release date, and receive an exclusive ‘early bird’ offer when the book is ready to be published, fill in the form to the left.